The global 5G infrastructure market is growing at a robust rate and is expected to witness a CAGR of 75.09% during the forecast period. The report presents a detailed market analysis including an in-depth analysis of the market drivers, opportunities, challenges, and growth trends mapped across core network, radio access network, application, and region. The market is segmented based on communication infrastructure (radio access network, core network, and transport network), application areas, and regional presence. The harmonized spectrum allocation coupled with the device availability, is one of the pressing matters to be looked upon in the current scenario. The effort to deliver such solutions, along with the growing application across various verticals, is acting as one of the major drivers for the global 5G infrastructure market. The surging demand from various applications such as healthcare, industrial, and automotive, along with continuously evolving Internet of Things market, have been identified as the key opportunities that could escalate the market growth in the coming years. However, fiber backhaul connectivity, spectrum allocation, and device availability continue to remain the pain points of the market. The communication infrastructure chapter is the result of a comprehensive and rigorous research. The chapter is divided into three broader categories including radio access network, core network, and transport network. The information supplied in the report includes key market players, market size, key restraints, and growth opportunities. The extensive trials and 5G use cases have indicated a plethora of application areas including remote machinery, smartphones and tablets, autonomous driving, intelligent navigation, and telemedicine, among others. The report provides an exhaustive application analysis including the market statistics for different verticals, such as consumer electronics, and automotive, and enumerates various use cases with a futuristic roadmap for each industry vertical. Being an extensive research study on the leading as well as developing regions in the 5G infrastructure market, such as Asia-Pacific, North America, and Europe, the report provides the market statistics, drivers, challenges, and opportunities across these regions. The report also formulates the entire supply chain of the market, along with industry trends of 5G infrastructure hardware components, technologies, and fiber network with emphasis on market timelines and technology roadmaps, and market dynamics. Some of the key players identified in the report are AT&T Inc. (U.S.), Verizon Communications Inc. (U.S.), Telefonaktiebolaget LM Ericsson (Sweden), Huawei Technologies Co., Ltd. (China), Samsung Electronics Co., Ltd. (South Korea), and Qualcomm Technologies, Inc. (U.S.), among others. • How the drivers and growth inhibitors are expected to shape the outlook of the market? • How the trials and government initiatives are anticipated to influence the 5G infrastructure market? • How the industry standards and collaborations are expected to impact the growth of 5G market? • What are different use cases and roll out models for the 5G infrastructure market during the forecast period? • How the core network technologies under the communication infrastructure segment of 5G market is expected to perform by 2025? • Which sub-segment among the radio access network (RAN), core network, and transport network of the communication infrastructure segment is projected to drive the 5G infrastructure market? • Among the automotive, energy and utilities, industrial, and consumer electronics applications, which is going to dominate the 5G infrastructure market during the forecast period? • Which region is expected to lead the global 5G infrastructure market by 2025? • How the key players are influencing the 5G infrastructure market? • What are the differentiating features of the key players present in the ecosystem? • How are the key players in chipset manufacturers, network partners, and network operators influencing the 5G infrastructure market? 8.3.4 Huawei Technologies Co., Ltd.
8.3.5 Samsung Electronics Co., Ltd.
8.4.4 Huawei Technologies Co., Ltd.
8.4.5 Samsung Electronics Co., Ltd. The process of the evolution of 5G infrastructure hardware components and the technologies of networking has considerably changed the global telecommunications industry in terms of cost-effectiveness, reduced latency, and convenience of the users. The global 5G infrastructure market is growing at a robust rate and is expected to witness a CAGR of 75.09% during the forecast period. Moreover, the radio access network segment is gaining popularity with an increasing number of base stations and is expected to grow at a significantly higher rate in the future. The 5G infrastructure market is witnessing a transition due to the increasing data traffic and demand for high network speed from end users. There is no doubt that the market has many factors responsible for the growth of 5G infrastructure systems, but there are certain restraints that could plague the 5G infrastructure market in the coming years. For example, the poor availability of fiber backhaul network in many countries, such as the U.K., has hindered the deployment of small cells for 5G networks. Also, a wide consumer acceptance for 5G networks with a need of device compatible with these networks plays a crucial role in the growth of this market. The 5G infrastructure market has been tracked along the lines of communication infrastructure (radio access network, core network, and transport network), application areas, and regions. Revenue generated from various application areas, namely energy and utilities, industrial, automotive, and consumer electronics applications have been analyzed. The report also covers the 5G infrastructure market on a global scale and consequently provides revenue data of the key regions. A separate segment specifically has been dedicated to the key global regions: North America, Europe, Asia-Pacific (APAC), and Rest-of-the-World (RoW). The radio access network plays an important role in the telecommunication system as it forms the connection between the device and the core network. The overall cost of a set-up depends significantly on the area covered for network distribution, and equipment like small cells, macro cells, and antenna systems, and others. As a result of the rising number of internet users, the need for faster network, and a harmonized spectrum has increased which is contributing to the growth of the 5G infrastructure market. The usage for 5G infrastructure systems in a number of applications is expected to have a significant share in the next five years. This increase can primarily be attributed to the increasing consumer inclination towards low latency, and high-speed internet; and the trend of connected ecosystem with the growing IoT space. 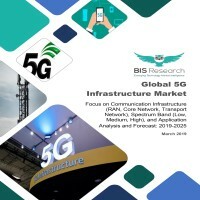 The market study by BIS Research has identified North America as the leading region in the global 5G infrastructure market accounting for almost 37% of the net revenue generated by the 5G infrastructure; and estimates that the region will continue its dominance during the forecast period as well. APAC too is anticipated to be a promising market with the multi-fold rise in demand expected from South Korea, Japan, and other Asian nations.